This is lesson 2 of 42. This series is currently in-progress and will have new lessons each week, visit Bethany’s author page to see the latest available. Bibles, a large piece of paper with the words ALPHA & OMEGA written on it, key verse (John 1:1) printed on a piece of paper, blank paper and markers or colored pencils for each child in the group, two sets of memory verse cards (write 1-2 words on each card for a total of 12-15 cards per set). Start the lesson off by reviewing the previous lesson- “God is Almighty.” Have one of the kids in the group remind you of the definition for Almighty and remind you of the motion and where in the Bible we see God as almighty. Start the teaching time, by asking kids to name some things that identify the beginning…. (5) the beginning of someone’s life- when a baby starts growing inside their mom, etc. (4) the end of life- death, etc. Explain that everything has a beginning and an ending, but that this morning we’re going to see that one of the truths about God in the Bible is that He is the beginning and the end. The WORD was in the beginning…..He didn’t have a beginning…He was the beginning. The WORD was with God….so God the Father was there in the beginning. The WORD was God… God and the WORD are One. The WORD is Jesus…which we’ll see more clearly in verse 14 (The Word became flesh….). Jesus didn’t begin when He came to earth. He had been since the beginning. Jesus was part of the creation of the world…the world was made through Him. Before Jesus came to earth, God sent John the Baptist to tell the people that Jesus was coming. Jesus came to earth as a man (verse 14) and He lived (or tabernacled) with His people. Jesus came from the Father. Jesus came to make the Father known. ALPHA & OMEGA = Beginning and End. Since motions & actions help kids remember, choose an action for ALPHA & OMEGA. A good motion might be to reach your arms as far to the sides as you can. EXPLAIN: In the case of God this means that He has always been and always will be. He was there in the beginning, will be there in the end and every moment in between.….you might want to explain this name for God by telling the kids that Alpha and Omega are the first and last letters of the Greek alphabet, so it would like saying that God is A & Z or even A to Z.
Divide into 2 teams and give one person on each team a set of memory verse cards. When you say GO, teams should race to get the verse put in order without looking it up in the Bible. When a team thinks they have the verse in the correct order they should say “order” which means the other team should pause while the leader checks their verse. Once both teams have the verse in the correct order, they should look it up in the Bible and read it together as a group. Read the memory verse (John 1:1) a few times together. Look back at the passage you just read (John 1) and ask the question – why did Jesus come into the world? Why did God Himself enter human history? Point them to the truth that He came to make God known (verse 18), He came to bring people into God’s family (verse 12) and ultimately He came to die for His people and pay the price for their sin. Remind them that since Jesus is life (verses 3-4), that none of us would have a beginning without Him, and without Him, our lives will end in eternal death and punishment, but with Him we have life. Give each child a blank piece of paper provide markers or colored pencils. 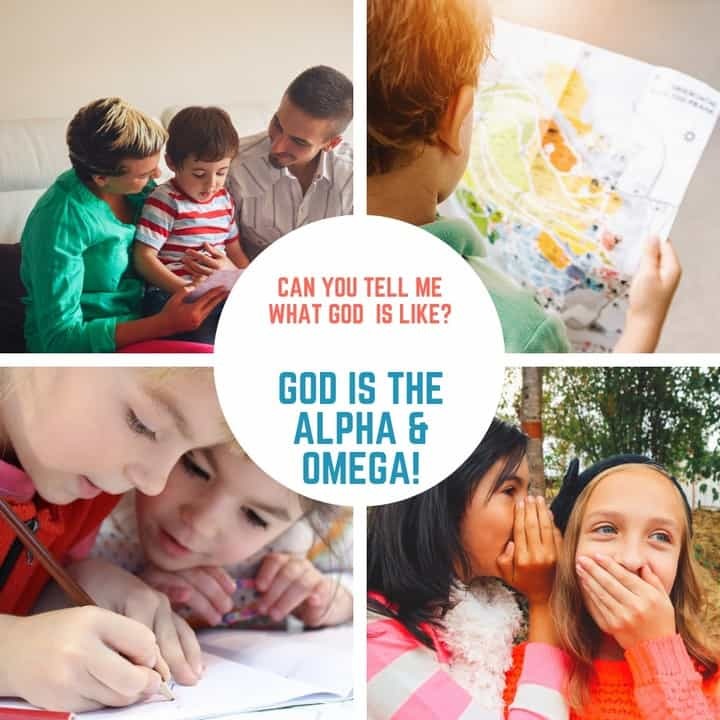 Encourage them to write the words alpha & omega somewhere on the paper and then write or draw something to help them remember this attribute of God. They could write the definition for alpha & omega or the memory verse or they could illustrate any of the passages you read about God being the alpha & omega. If anyone in the group has a hard time figuring out what to write or draw, encourage them to make a timeline of their lives (started with birth and will end with death) and draw a timeline of God (no beginning, then the story of the Bible, and then no ending). After a few minutes, bring the group back together and give kids time to share what they have drawn or written. Take a minute to praise God for being the Alpha and Omega and to thank Him for sending Jesus into the world to take our place on the cross. Filed Under: John, Lesson Plans, What is God Like?